A few months ago, HubSpot released a blog post that aims to predict 2018 content trends based on data from 2017. This post was used to help pontificate types of content consumers might seek out in 2018 and on what platforms they will search for it. If you read our blog post, Video is King: Content Trends in 2018, you know what I am talking about. HubSpot definitely has one thing right, video content is highly sought after and one of the most effective means of communication. However, the type of video content your audience wants, how often they want to see it, and where they are looking to find it, depends on certain demographic variables, like their location and age. During HubSpot's research, they collected data from the U.S., Germany, Columbia, and Mexico. 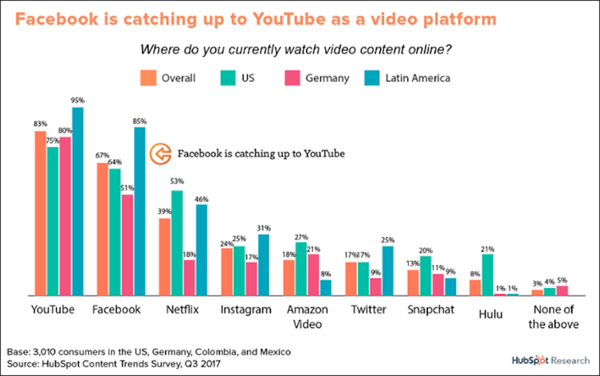 What they found while sifting through data from these geographical regions was that Columbia and Mexico in particular absolutely love video content, more so that the U.S. or Germany. 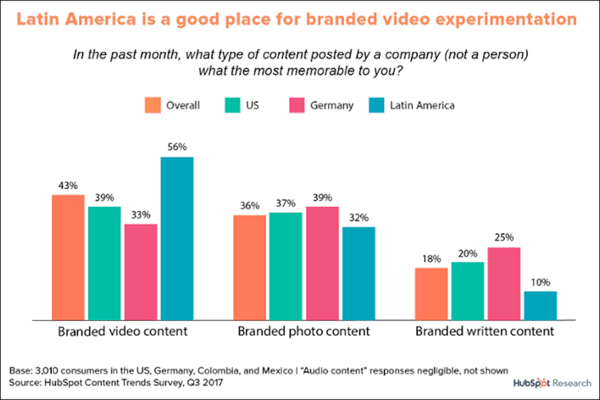 While video content is popular in every region, there are different preferences to other forms of media when asked if the video is preferred over photography or written content. As you can see, Germans actually seem to prefer still images to video content. They also seem to favor written content as well. This is much different than the U.S. consumers data. In the U.S., 39% of people enjoy video content the most, however photo content is preferred by 37% of people, so there really is no clear-cut winner when it comes down to video vs. photography in the U.S. This statistic also is turned upside down when you take video content in America and distribute it as an advertisement. People in the U.S. seem to find video-based ads as a nuisance and frustrating. When asked, "If you have to see an advertisement online, what format would you prefer it to be?" U.S. consumers were found to opt for video ads 30% of the time, while 55% lean towards image-based ads. This holds true for Germans too. 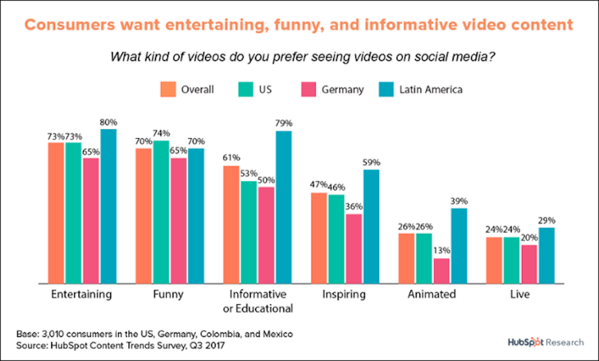 When asked the same question, 24% of Germans side with video-based ads, but 51% of Germans chose to side with image-based ads. Video Traffic: Where does it come from? Social platforms are used almost as much as search engines to discover content today. YouTube and Facebook lead the way when it comes to consumers searching for video content. This is true across the U.S., Germany, Columbia, and Mexico. While people visit these platforms to consume video content, they are interested in a few different things like education, entertainment, and comedic relief. People from around the world want to learn something new, laugh, and watch something amusing. If your video content does not fall into one of these three categories, you may not see the full traffic potential of your video. Overall, HubSpot found 73% of people are looking for entertaining videos, 70% of people are looking for funny videos, and 61% of people are looking for informative videos. After these three types of video, there is a large drop off in people's desire to watch either inspiring, animated or live video content. Only 47% of consumers are actively seeking inspiring videos, while even fewer people are looking for animated video content (26%), and only a small percent (24%) of people are searching the internet to watch live video. Now, these types of video content are being viewed and searched for in new ways. Yes, search engines like Google are still playing a pivotal role in the way consumers look for content, but social media platforms, especially Facebook, are starting to challenge search engines by offering content to people in a passive manner. 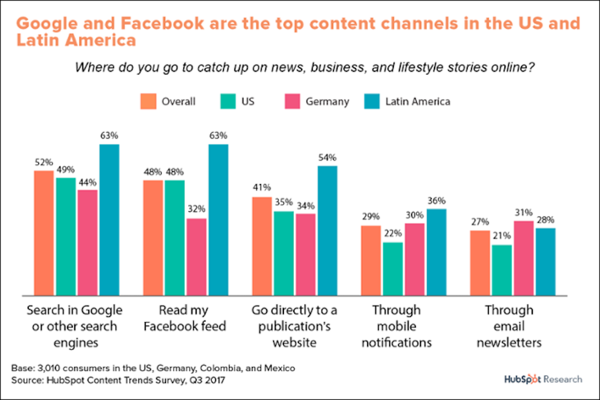 HubSpot's data shows that 52% of people turn to Google or another type of search engine to find the content they want, while 48% of people are scrolling through their Facebook feeds to catch up on the news, business and lifestyle stories. This proves that people are using social media platforms as real sources to consume and search for answers, products, reviews, news and educational videos. A little over a month has passed in 2018 and already there are some content trends that marketers can use to help them reach the right audience. Clearly, the production and distribution of video content is a top trend to consider. However, we cannot forget about the context of the video. Automated advertisements at the start of a YouTube video seem to drive people crazy and most likely is not worth the investment. However, creating quality, informational, and entertaining video content can become beneficial to your brand. As 2018 moves along, video content will become more important to your brand, and where you distribute this content will also play a large role in how your brand is perceived. People want to learn something new and they want to do it quickly. Keeping your social feeds full of short, entertaining, funny and/or informative videos is a way you can ensure consumers that you are the right solution for their needs. Reaching your audience where they live in a digital world is very important. No one is going to actively look for your content when they can passively consume it on social platforms. The way people search and the way search engines rank content is in the midst a large shift, but we still need to find a way to get consumers the solutions to their challenges and meeting them on social media is a great place to start.